Entries will be opening early April. The relay comprises of 6 legs. The route is just over 34 miles long and runs from Leighton Buzzard to Northill on a ‘way-marked’ route. It is multi terrain. You can also enter solo (see website for details). Start time will be approximately 10.30am. Please comment below or pm Debbie Dickinson if you would like to take part. The cost is £5 per person (£30 per team). Details for payment to be confirmed. It’s a well organised event and ends at a village pub. We will put runners into teams or you can make your own team. If you have a preference of which leg you would like to run please let me know. Let’s get some Redway Runners Teams entered this year. Please note this event sells out within a couple of weeks of opening. 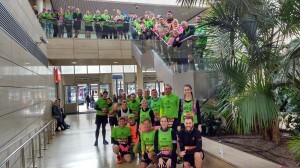 Notice is being given of the Redway Runners AGM to be held upstairs in David Lloyd on Tuesday 2 May from 7.30-9pm. All paid members are invited. I started running Jan 2016. 5k took 49 minutes. I set a goal to run the whole way, and to do it in under 40 minutes. I joined Redway Runners in Jan 2017, I was now running 5k in just under 43 minutes and could run the whole distance but still had not achieved my goal of under 40 mins. I was advised at my gym that if I was not achieving my goals I had to change something, luckily a beginners class was just starting so I signed up. 9 weeks into the course I tried 5k again and was down to 40:39 just 39 seconds off my goal- almost 2 minutes quicker than when I started AND I felt strong enough to run the route again 15 mins later for fun. Massive improvements, new friends, heaps more confidence. Running in a group is safer, more engaging, and more encouraging. Best decision I’ve made in 2017 so far ! Joining RR was one of the best things I have ever done. Getting older & overweight I have tried many things but never stuck at them. I joined the January 2016 beginners group with the view that I just wanted to complete parkrun! I have now run about 36 parkruns, a number of 10ks & am signed up for my first half marathon in may. At 42 I am fitter than I have ever been! I love That RR have so many club runs & that even though my husband works shifts, I can always get to at least 2 runs per week. The other thing I love is that RR is just £5 to join & that all the amazing run leads give up their time to run the groups simply because they love it too!! I joined the Annette Smyth beginners course in Jan 16 as a friend persuaded me. I had completed couch to 5k a year previous but then my running buddy ran off to OZ and I just didn’t like running alone. I love running because it has given me confidence and self esteem which I was lacking before. Through the club I have made life long friends who I wouldn’t be without & who are so supportive. At the beginning I was self conscious and hardly turned up but I got to know a few people I started to really enjoy it. All I wanted was to say I could run 5k. Now I have achieved distances I never thought possible. I am on the final week of the beginners course and i can honestly say it’s been the best thing I’ve done in ages! I joined because i wanted a new challenge, to get fit and increase my confidence. Running is not something that comes naturally to me and at times it’s been tough, but I’m so proud of my achievement so far and looking forward to my graduation run on Saturday. Plus I’m already setting myself goals for future running! 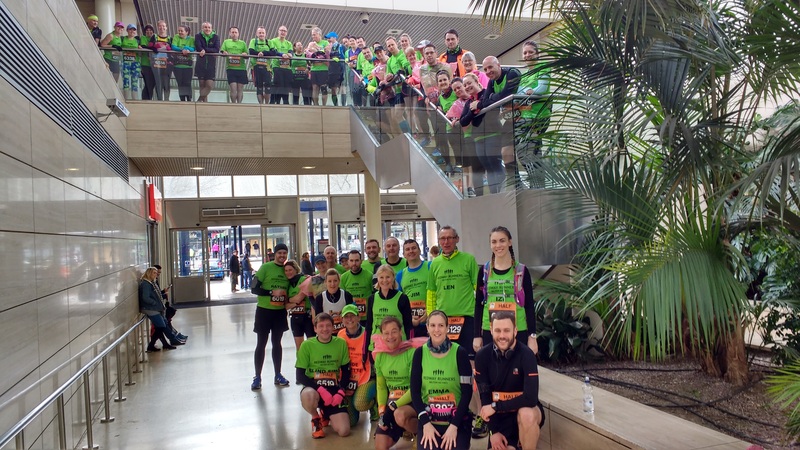 Redway Runners are a lovely bunch of people who have been incredibly supportive and clearly want other people to enjoy running as much as they do. I was not a beginner when I joined, but I may as well have been. I had been running for 5 years before I joined.. I loved running, but was losing motivation running on my own. I joined in May 2016 and my life was transformed. My stress levels are now at an all-time low, my running has improved in every possible way and I have made countless new friends, who have been hugely instrumental in my improvements. It is a club which helps so much, you want to give something back. I have mentored a friend run her first half-marathon, I have helped a lot with beginners and I will soon be leading my own beginners class. To crown an amazing first year with the club, I am running my second marathon in Liverpool, something which would not be happening without Redway Runners. I love the RWR because they are such a brilliantly inclusive community. I joined about a year ago as a relatively new runner and as I have progressed in my running I have been able to find different groups to suit my training- chatty runs, long runs, intervals, hill work: we do them all. The RWR encourage me to be the best runner I can be and I am delighted to see the progress I am making. I just took 13 minutes off my half marathon pb at the Silverstone Half Marathon and I am already looking forward to the London Marathon, where all the hard work and variation in training will really come into its own. I joined Redway Runners about four years ago. From Day One they were brilliant. Everyone in the club looks after everyone else. 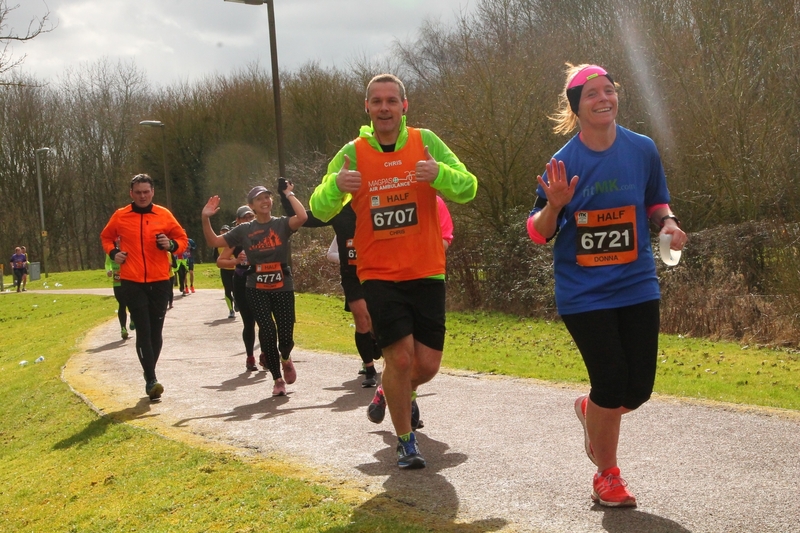 There are some very fast runners and some quite slow ones…..but we all share the same passion. We all talk together. We range from 16+ to 70+ but we are like a great big family. For me, joining the club was a liberation. I’ve had clinical depression for over fifty years, but re-discovering running with RR made such a difference. The friendships I’ve made, the regular runs and the huge support from the club members has been transformational for me. Over Christmas 2015 my daughter starting pestering me to sign up to Race for Life in 2016 and, after too many glasses of champagne, I finally agreed. A week later I was celebrating my 50th birthday and wondering how on earth I was going to get my unathletic body and a teenager to commit to a training plan. Well, that was the easy part. I signed us both up to a beginners’ course with Redway Runners. A year later and I have run that Race for Life, many parkruns, numerous other 5 and 10km events, 6 half marathons, one twenty miler and I will run my first marathon in May. My daughter will run her first half marathon this year. Something happened on that beginners’ course and running has taken over our lives. The support you get as a beginner, the graduation, then moving into the other group, first step up and then social and club runs. Did you ever imagine that you would want to do cross country again? Run a relay? Represent a club? Well you can, and there is no elitism about it, everyone is encouraged to join in. What is particularly fantastic is everyone’s efforts are applauded. You are congratulated and supported simply because you chose to come out and take part. And you don’t have to run to receive this support. Volunteers are enthusiastically acknowledged and everyone takes the time to thank marshall at events, run leaders, tail runners/riders and supports. Although it is not my favourite colour I am very proud to wear the Redway Runners green, and to be a part of this amazing club. Just been advised that Simon Richards from the club has won the Sport Achiever of the Month for March 2017 from Sport MK. Well done to Simon, you will receive a small cheque as part of the award, and will be invited to the Sport MK AGM in June where will receive your Certificate of Achievement presented by the Mayor of Milton Keynes. 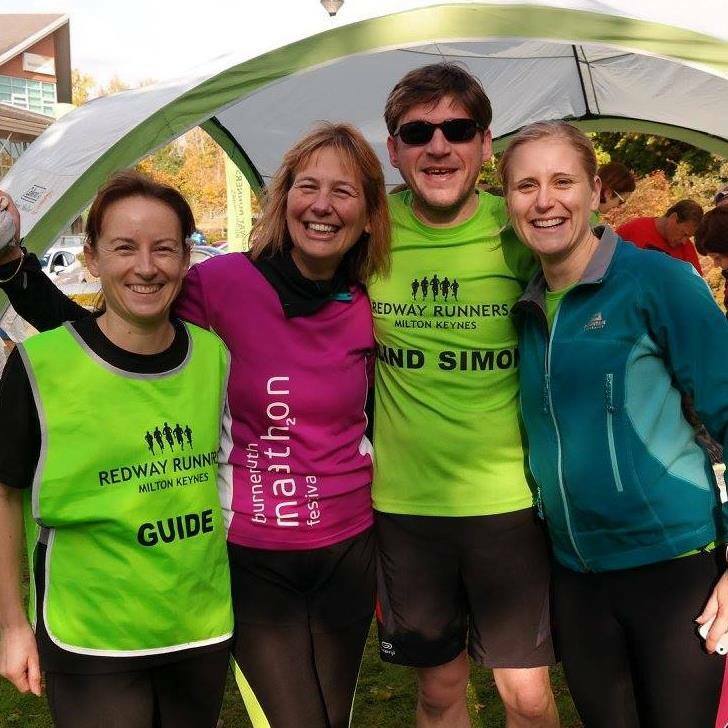 Congratulations from all at Redway Runners to Simon and to his three main guides of Suzy, Annette and Lauren – fantastic news. We are pleased to let you know we are starting our next new free beginners groups in April 2017 (just after the Easter holidays), we have lots of courses starting. 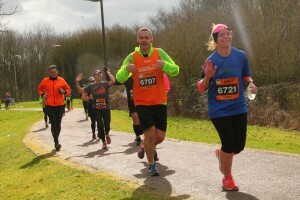 They working towards doing the MK Willen Lake free 5K parkrun on Saturday 1 July, one of the course is an extended course lasting over a few more weeks so taking things a little easier. If you want a place you need to act quickly as all these courses will be limited to 50 places. For these courses we are using a new on-line process for booking and registration to the club – we hope you like if. Many Redway Runners of all abilities competed in their first races. These included Gillian Firmin (half), Andrew Riddy (10k), Jenny Moorhouse (20 miles), Franzi Florack (20 miles) and Donna Middleton (half). Impressive personal best performances were achieved by John Flanagan (half), Robin Grimmer (half), Dan Willis (20 miles), Sam Wheeler (10k), Claire Burgess (10k) and Tara Needham (20 miles). 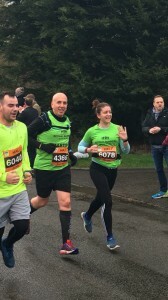 And a special mention to Chris Humble completing his 1st half marathon raising money for the Magpas charity. Well done to everyone who took part. Redway Runners is an all-inclusive running club for every ability. With over 1,200 paid up members we offer regular running sessions every day of the week. Our next very popular Beginners Course starts on 22 April. If you would like to sign up, or learn more about the club, please visit www.redwayrunners.com or by following them on Facebook.